The Trade Association for Information Technology (TAIT) hosted a session for its members on the dynamic world of digital marketing and how it can harnessed effectively by members to grow and expand their business. TAIT focuses on having a pulse on the industry happenings and addresses challenges and roadblocks for members, in a timely manner. 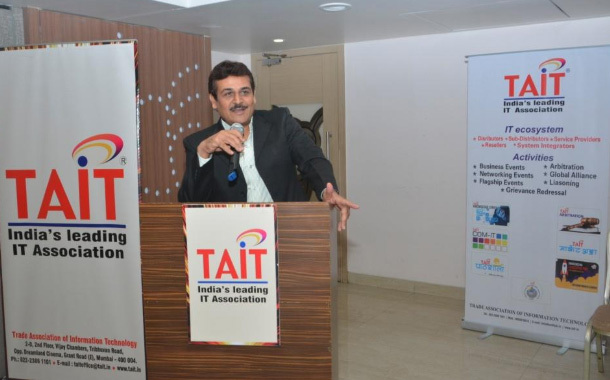 In line with the above objective, TAIT hosted Mr. Manoj Kotak, a passionate and reputed digital marketing expert, who has conducted more than 65 sessions on Digital Marketing for over 3750 attendees all across India. Mr. Manoj Kotak took the stage, picking up one topic after the other, transforming the fears and challenges into an adoptable solution. Speaking reassuringly to a hall packed with attentive audiences, Mr. Kotak further highlighted how digital is just a new platform for doing business, and took them through the step by step process leading to complete transformation of PUSH to Digital Marketing.